The idea of nibbling on dainty sandwiches and sipping tea out of delicate English tea cups did not seduce my husband. However, he finally gave into my pesky demands to try this English tradition when I suggested the champagne afternoon tea option. Back in February, we took the train out to Bath, about 90 minutes west of London, and spent the weekend there. 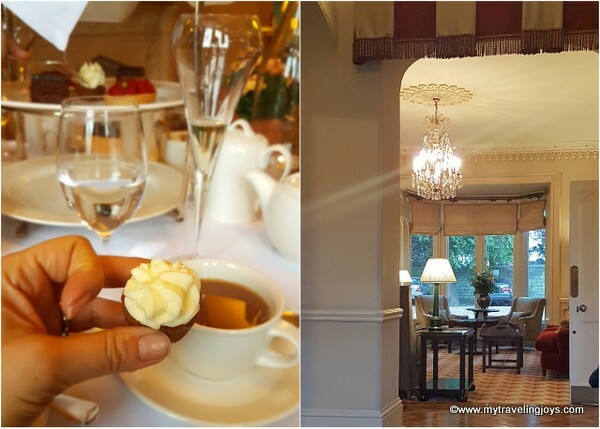 Besides sightseeing, I booked us in for Afternoon Tea at The Bath Priory, an elegant 1835 Georgian manor (now hotel, spa and a-Michelin-starred restaurant) nestled within four acres of beautiful gardens. The setting couldn’t have been lovelier for my first time…noshing on afternoon tea that is. But the weather was typical English crap, and we walked nearly 2 km from the city center past the Royal Crescent building and botanical gardens in an ugly, drizzling spring rain. Once we shed our damp jackets at reception, we settled into a corner table overlooking the wet gardens. The hotel has a splendid terrace for dining when the weather cooperates. 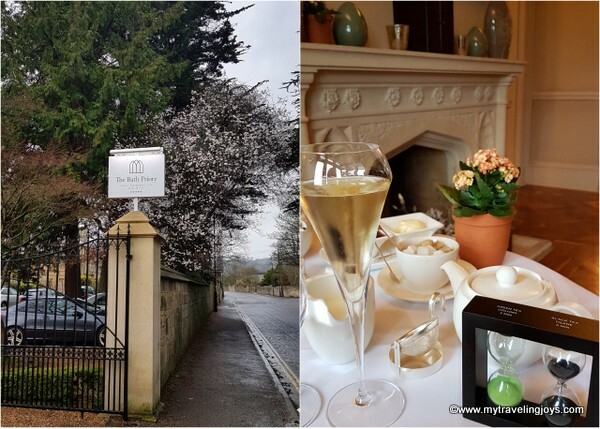 The Bath Priory offers its Afternoon Tea with champagne for 44 (30 without) so the cost makes the tea a special treat (though definitely far cheaper than the ones I’ve seen in London.) Like I said I had to tempt hubby with the booze option, so we chose the champagne menu. 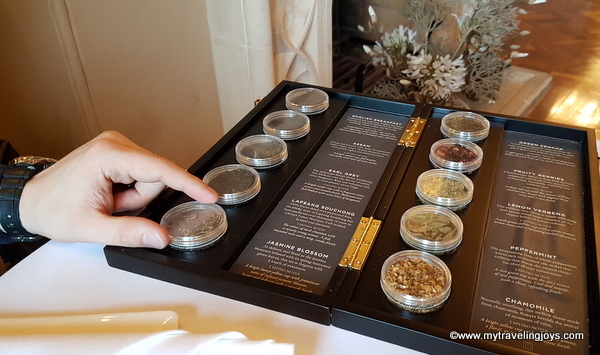 We also received an unique tea menu where we actually could smell the different teas before selecting the one we wanted. I had no idea it would be so involved! Soon the tower of afternoon tea treats arrived. Basically, you better come to tea hungry because you are eating a full lunch. We ate breakfast around 10 a.m., knowing that tea would be at 3 p.m. We started with the finger sandwiches, and although well made, the flavors didn’t really wow me. The sandwiches included: roast chicken with tarragon, local ham with mustard, egg salad with watercress and smoked salmon with cucumber. But then we dived into the petite pastries and scones. OHMIGOSH…the scones! These were like nothing I had ever eaten before. Picture the most tender, flakiest buttermilk biscuit you’ve ever had in your life – served warm with a giant mound of English clotted cream and homemade strawberry jam. Holy cow! The clotted cream reminded me of Turkish kaymak (a clotted cream made from water buffalo’s milk). Forget about calories and just eat the damned scones! They were sooo delicious! 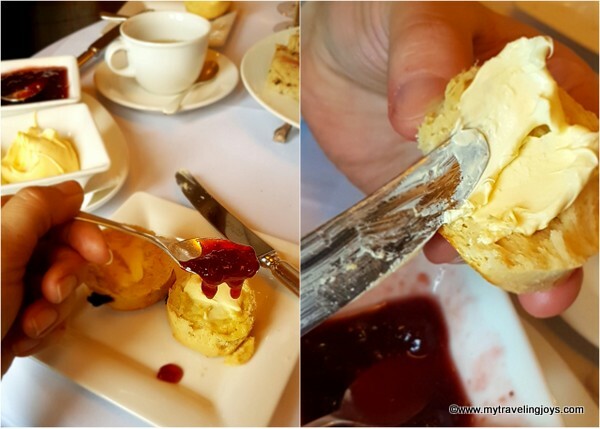 I wanted to spread the cream on everything and just eat the scones! Surprisingly, the British tradition of afternoon tea is only about 200 years old. In the 1830s, Anna Russell, Duchess of Bedford, is credited with first making Afternoon Tea into a formal social occasion. Finding herself quite peckish in the gap between lunch and dinner, the Duchess began inviting friends to enjoy tea and light snacks at the Woburn Abbey. When she returned to London, she continued the practice and thus Afternoon Tea became a fashionable ritual for the upper classes. In the 19th century, tea rooms were becoming quite popular and were THE place to meet friends and gossip. They were also considered respectable places for young women to meet without chaperones, so a perfect excuse to get out of the house, in my opinion. 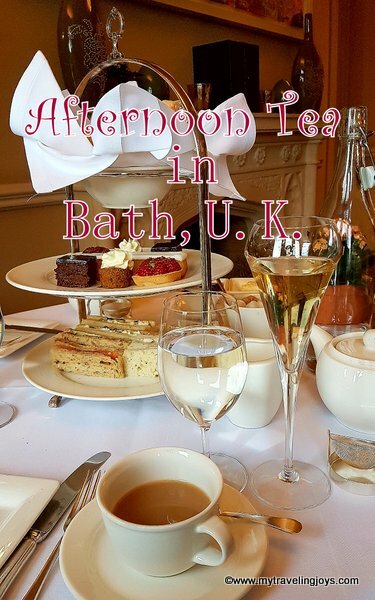 In Bath, there are several cafés and formal tea rooms that offer afternoon tea. 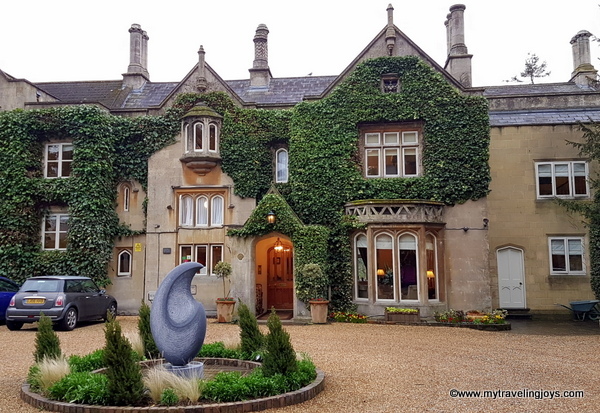 Reservations are highly recommended, even weeks in advance if you are going to Bath on the weekend. Just like anything else when it’s your first time, afternoon tea started out a bit awkward for these two Americans. We weren’t quite sure what to do or how to properly act. 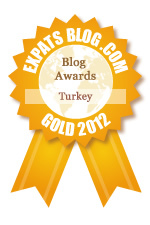 Should we have our pinkies out as we sipped tea, perhaps? Well, we ended up devouring nearly our entire tower of treats so I’d say we mastered Afternoon Tea and had a grand time doing so. Maybe I could convince hubby to do another round? 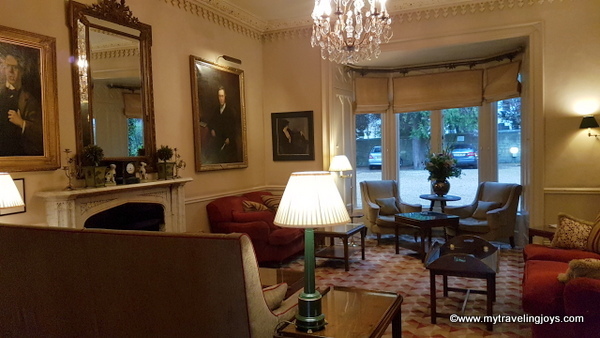 One of the formal sitting rooms at The Bath Priory. hahaha! so glad you discovered this! i love high tea! and though i rarely eat sweets, one of the most decadent things in the world is sconces with clotted cream and jam. might be one of my all time favorite things. Sounds like you had a lovely afternoon.